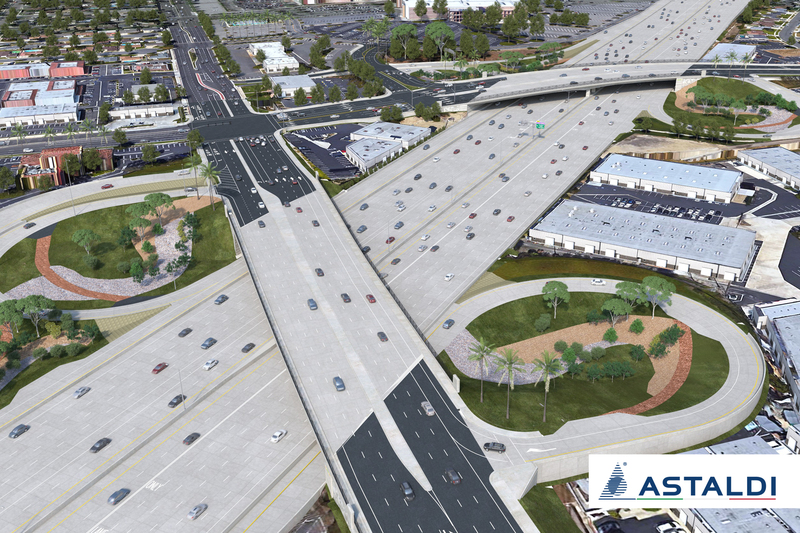 The Astaldi Group has won in California, the contract for the improvement of the I-405 in Los Angeles. The contract is valued at US$ 1.2 billion. This is a major and new success for the Astaldi Group, which is aiming to consolidate its presence in the United States by extending its activities to the West Coast. Astaldi holds a 40% stake in the project. The contract calls for the design and construction of the improvement works for 22 kilometres of interstate highway. The complexity of the works, which also includes the construction of 35 bridges, is accentuated by the need to maintain the infrastructure in operation for the entire duration of the activities. The works, commissioned by the OCTA Orange County Transportation Authority, will be financed with local, state, and federal funds. The works have a duration of 6 years, and will be carried out in joint venture with the Spanish Group OHL (holding a 60% stake). The Astaldi Group has been present in the United States for more than 20 years through its ACC Astaldi Construction Corporation, and operates mainly in states on the East (Florida) and West (California) Coasts. Winning the I-405 contract brings to a total of approximately US$ 580 million of backlog in execution in the United States.